Also, please check out my girl Skin &Tonic’s summer savior box! We think that between my makeup box, and her skincare box, we are your perfect summer skin and beauty duo 😉 We’ve got you covered! Are you melting? Your makeup doesn’t have to! 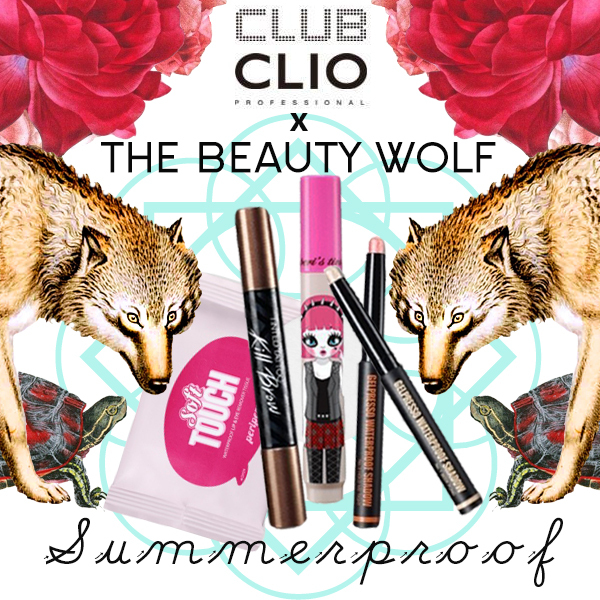 I’ve curated some of my very favourite, tried and true items from Club Clio USA, that will keep you fresh throughout the entire summer and beyond. I’ve rigorously tested these items (hello hot yoga class) and I adore them all. Another bonus to this selection of products is they are all self contained little wonders of beauty that require no brushes or additional tools to create a stunning, waterproof, lifeproof look that will serve you well on the beach or just out with friends on the town. Clio Tinted Tattoo Kill Brow: Brows are everything right now, so why not showcase them with a product that’s as tough as it is beautiful. Clio Tinted Tattoo Kill Brow is a two in one tint and browcara that both fills and grooms your brows. Unlike some other brow stains and browcaras, Tinted Tattoo Brow Kill gives an extremely natural, soft look, all in one handy tube. I’ve chosen a versatile shade that could work with just about any hair colour, so chances are, this will work beautifully for you! Clio Gelpresso Waterproof Pencil Shadow: These eyeshadow sticks are the handiest, easiest, most foolproof way to get gorgeous eyes. The smooth gel pencil texture is easily blended with your fingers (no brush needed!) to create a shimmering masterpiece. Once set, they don’t budge! Beer Pong is an incredibly versatile shade. It can be used as a browbone highlight, base color, teardrop highlight or to highlight the “aegyo-sal” under the eyes. Hold Me Tight is a stunning pinky-orange with gold shimmer that makes your eyes look like a pond reflecting a sunset. Combine both shades for a fresh summer twist on the smoky eye. Peripera Peri’s Tint Marker: This sweet product doesn’t get enough attention in my opinion and I’m so happy to be able to share it with you all! It’s everything you need for a tinted lip that lasts, in one adorable package. I also love the sweet pink shade I’ve selected, as I’ve used it on many different skintones and it’s been pretty universally flattering. The pink gives you that “my lips but cuter” look that works for both day and night. Another thing I love is it’s precise application tip, which completely does away with the need for a lipliner! Peripera Soft Touch Waterproof Lip & Eye Remover Tissue: With all of these amazing waterproof products, I can’t leave you hangin’ in the remover department! Whip out one of these soft babies to make short work of removing both lip and eye makeup. Very handy to keep in your bag, because you never know where this summer is going to take you!